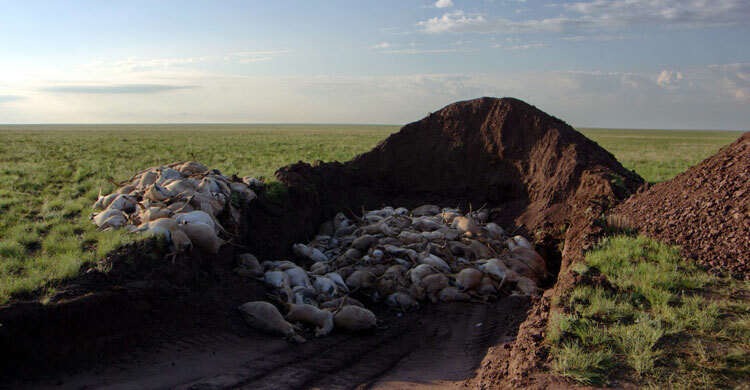 Bonn/Astana, 28 May 2015 – More than 120,000 saiga antelope have been confirmed dead in central Kazakhstan, representing more than a third of the global population. 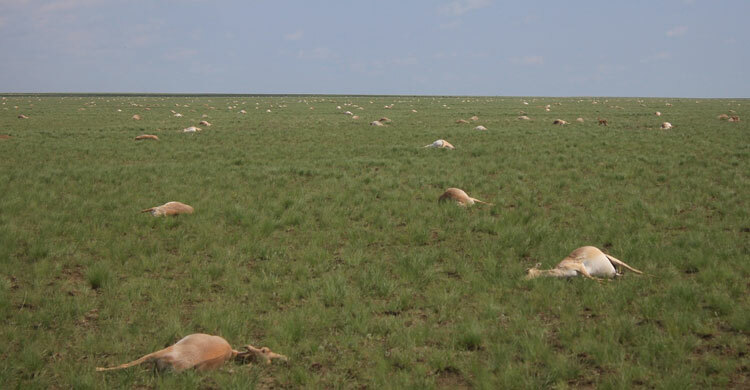 This is a major blow for conservation efforts given that saigas have in the past ten years only just started to recover from a global population size of less than 50,000 animals following a 95% crash in numbers. 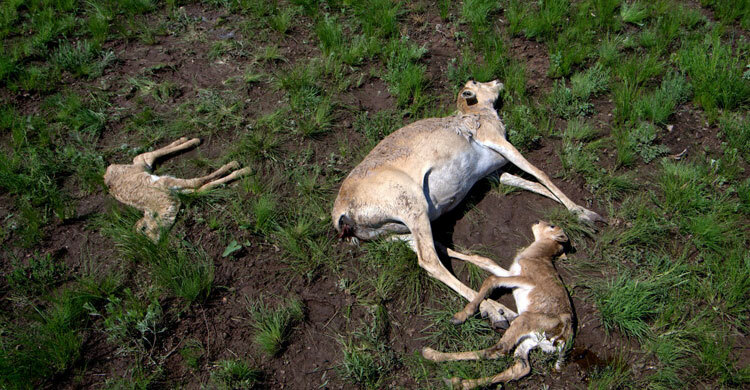 CMS Executive Secretary, Bradnee Chambers said “Authorities in Kazakhstan are responding quickly to this disaster and are working hard to solve the mystery behind this mass saiga die-off. I am pleased that the international expert mission we were able to send, at very short notice, is now contributing to these efforts". “Experts are working around the clock to investigate the impacts in terms of wildlife health of the relatively high rainfall observed this spring, the composition of the vegetation and other potential trigger factors including a suite of viruses. None of the data analysed to date indicates that rocket fuel is related to the mass die-off. Fresh laboratory results are becoming available every day,” says Aline Kühl-Stenzel, Terrestrial Species Officer at the UNEP/CMS Secretariat, who has been supporting the expert mission remotely from the Convention’s headquarters in Bonn, Germany. Kazakhstan has been actively implementing the CMS Memorandum of Understanding concerning Conservation, Restoration and Sustainable Use of the Saiga Antelope (Saiga MOU), not least through establishing new protected areas and anti-poaching patrols. Other partners that have signed the MOU, namely the Frankfurt Zoological Society and the Association for the Conservation of Biodiversity of Kazakhstan (ACBK) have been providing funds, as well as technical and logistical support for the emergency response, including the CMS expert mission. The Saiga Conservation Alliance, another partner of the MOU, has provided scientific input. “Saiga antelopes often have twins and populations are able to rebound quickly. Our hope is that if we can control what is driving these mass mortality events as well as tackle the number one threat to saigas – wildlife crime and poaching – populations will be able to recover. Collaboration among all stakeholders is vital. Kazakhstan is leading the way and I look forward to the Range States putting in place strong policies at the CMS Saiga meeting,” said Chambers. The third Meeting of Signatories to the CMS Memorandum of Understanding concerning Conservation, Restoration and Sustainable Use of the Saiga Antelope (Saiga MOU) is scheduled for the autumn of 2015. Consumer countries of saiga horn will also be present at the table as well as the CITES Secretariat, to review implementation and adopt an updated work programme, including measures for wildlife health management. The MOU is part of the CMS Central Asian Mammals Initiative (CAMI), a framework for the conservation of large mammals across the region, and was adopted by the CMS Conference of the Parties in November 2014. The Memorandum of Understanding concerning Conservation, Restoration and Sustainable Use of the Saiga Antelope(Saiga spp. )is an intergovernmental instrument developed under the auspices of CMS dedicated to the conservation of saiga antelopes across their five Range States (Kazakhstan, Mongolia, the Russian Federation, Turkmenistan and Uzbekistan). The MOU has been in force since 2006 and has been signed by all Range States, as well as eight Cooperating Organizations, namely the Association for the Conservation of Biodiversity of Kazakhstan, Fauna and Flora International, the Frankfurt Zoological Society, the International Council for Game and Wildlife Conservation (CIC), IUCN/SSC, Saiga Conservation Alliance, Wildlife Conservation Society and WWF International.